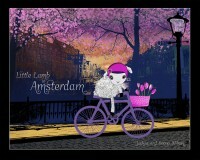 Explore the Netherlands with Little Lamb, on her bike journey, across the country. You will ride past must-see attractions, discover Dutch art, culture, food and learn many interesting and educational facts along the way! Click on the youtube trailer link below.